Anthony ‘Sconey’ Forrest and Wayne Robert King at Parliament House for the 2009 National Apology. Photo: George Serras. AFA welcomes the four Australian Government projects and has provided strategic policy advice during planning and implementation. Caring for Forgotten Australians, Former Child Migrants and Stolen Generations: an information package for aged care services was launched in 2016. AFA has worked with government, aged care industry representatives and the other national advocacy groups in the development of this package since 2010. AFA welcomes this package as an important first step in improving support for older Forgotten Australians across the aged care sector. As the Prime Minister announced in his Apology on 16 November 2009, the National Library has conducted an oral history project to record the lives and experiences of Forgotten Australians and Former Child Migrants. Interviews were conducted across Australia, will be preserved in the National Library and made publicly available, subject to any access conditions imposed by interviewees. Inside: Life in Children's Homes and Institutions shares the experiences of some of the half a million children who spent time in institutional 'care' in Australia in the 20th century. The stories, photographs and personal objects from Forgotten Australians, Former Child Migrants and members of the Stolen Generations provide a chance to understand something of a history that affected so many people and was hidden for so long. This chapter in Australia's story came to the fore in 2009 when the Australian Government made a National Apology to Forgotten Australians and Former Child Migrants. From the apology came funding for the Inside exhibition, on which this website is based. Inside was on show at the National Museum in Canberra from 16 November 2011 until 26 February 2012; the Melbourne Museum from August 2013 to January 2014; the Maritime Museum in Fremantle WA from 14 March to 29 June 2014; and at the Queensland Museum in Brisbane from 9 August to 17 November 2014. Inside: Life in Children's Homes and Institutions was developed by the National Museum of Australia and supported by the Department of Families, Housing, Community Services and Indigenous Affairs. View the web page for this exhibition here. Review of the exhibition Inside: Life in Children's Homes and Institutions here. Over 2000 comments/reflections by visitors to the exhibition, compiled by the Melbourne Museum, can be accessed here. The oral history project recorded the lives and experiences of Forgotten Australians and Former Child Migrants. It followed recommendations from two Senate Community Affairs References Committee reports Lost Innocents: Righting the Record - Report on Child Migration (August 2001) and Forgotten Australians - A report on Australians who experienced institutional or out-of-home care as children (August 2004). More than 200 people told their life stories in interviews, many are available in full online. The project also interviewed advocates and associated professionals including welfare officers, employees of institutions and administrators. The interviews record a variety of impacts of care experiences in Australia from the 1920’s onwards in over 140 institutions run by state governments, churches, non-government organizations as well as in foster homes. This oral history project concluded in November 2012. Listen to the oral histories here. 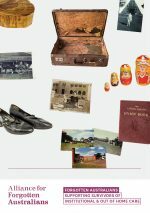 The National Library of Australia has produced a booklet titled You can't forget things like that. The booklet introduces the Forgotten Australians and Former Child Migrants Oral History collection held at the National Library of Australia. We hope the booklet encourages people to listen to the full interviews, and to know and understand the life history and experiences of Forgotten Australians and Former Child Migrants. The quotations in the booklet are excerpted from interviews in the collection. View the booklet here. counselling services for Forgotten Australians, from appropriately trained and skilled professionals. The Find & Connect web resource is for Forgotten Australians, Former Child Migrants and everyone with an interest in the history of out-of-home ‘care’ in Australia. View the webpage here.